Above is an aging painting I made of my obsession with Queen Mary when I was a teenager (and can’t believe how the years have passed). She is at a full-gallop at sunset on the North Atlantic with an enormous bow wave breaking at her stem due to speed. Racing at approximately 32 knots, she was the fastest, largest, most popular and luxurious liner on the transatlantic run. Her 24 boilers were 3 stories high and supplied steam to the engines which produced 240,000 horse power to propel the ship’s 81,000 tons. Although it is obvious I am not a full-fledged artist, creating this portrait of her was very satisfactory to me then and now. Many friends and family have color copies made which they then frame in 11X14. 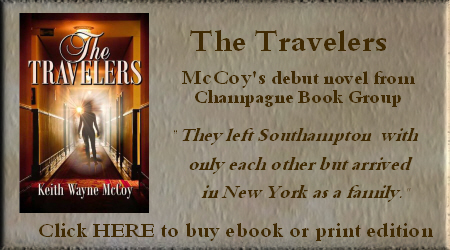 Below is an excerpt from “The Travelers” depicting Jim and Jess Bennett aboard in 1947 headed for New York. The building action prefaces the unnerving feeling Jim and Jess felt of being at full speed then, with a complete loss of power, absolutely dead in the water. This is from the last part of a chapter before the extraterrestrial encounter occurs. Guy was familiar with that lifelike facet of the Queen Mary and could easily imagine her asserting her dominance over the entire harbor. “Jess embraced her mother fiercely for a very long time but never broke. Her mother sobbed, as you can imagine, but Jess held her tight and silently hid her face in her mother’s hair. 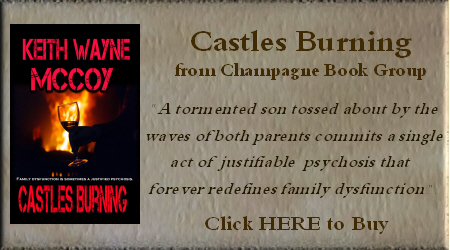 Her mother understood her much better than I and undoubtedly knew her daughter was screaming inside. After they parted, we walked up a narrow canvas gangway with Queen Mary emblazoned on its sides and Jess never looked back. Of course she didn’t look up, either, until we stepped aboard. She didn’t want to wave to her mother from the railing as we pulled away from dock. Safer that way, I suspect. “We found ourselves in another world. Queen Mary was not at all what I remembered as a troopship. Looking back, I can see how young we were with only one suitcase between us, standing so completely overwhelmed by those glistening wood interiors. We really were backward kids, barely out of our teens, and we wandered for hours taking everything in. How simple we must have appeared. She lingered in the Swimming Pool with its elaborate staircase and balcony, richly tiled all the way to the ceiling that was mother of pearl. It was empty but not quiet with the water splashing against the sides with the movement of the ship. The lounge was the most beautiful room on the ship and in light of what we would encounter there in a few days, I will grant you that Jess recalls every mirror, chair, and column just as I do. I remember how hesitant she was when we opened the door to our stateroom, B27, starboard forward. At first, she wouldn’t step over the threshold but peered in as if she were afraid her shoes would soil the carpeting. “The Dining Room was as soaring and majestic as any cathedral I had seen and we were both embarrassed to be so under-dressed. Good God, we were out of place with those tuxedoes and gowns all around us. I wore my uniform which had some formality but poor Jess had only a yellow chiffon dress she’d bought for Easter services a few years before. ‘Memories of a lifetime,’ I kept whispering to her. When a waiter came to our table and began to flambé a dish, all diners turned excitedly toward us. Jess was mortified. When the flames burst upward, she screamed and brought a ripple of laughter. Our unease must have been glaringly obvious because an older couple watched us from a nearby table for some time, smiling at us and we were certainly the topic of their conversation. Before dessert, they came over and introduced themselves as Frank and Emily Schofield from upstate New York and we were placed under their wing for the rest of the voyage. “Now, Guy, sometimes older people take a vicarious interest in young people in love because that is a part of their lives that has become history. They can’t help themselves. As you age, you’ll understand the fascination, mark my words. Well, Mr. and Mrs. Schofield had been married for so long that they were able to complete each other’s sentences, or rather, Mrs. Schofield completed his sentences. She always carried their conversation. I have never met another human being who could talk like her. Her husband rarely finished a sentence and he simply nodded when she asked, ‘Isn’t that right, Frank?’ I told Jess that we needed to open a porthole after she left to let all the words out. They seemed ancient to us but young people have no concept of age whatsoever and they were certainly not as old as I am today. “They owned three restaurants in Manhattan and were expert people-watchers. Mrs. Schofield proudly told us she knew from first sight that we were not newlyweds but were just beginning our marriage, we had never been aboard a luxury liner, we were not traveling for pleasure, I wanted only the simple things in life and, amazingly, she said that Jess was a very guarded person with her emotions. Looking back, I believe she recognized the obvious but we dumb kids thought she had some supernatural ability that, by the way, she did nothing to discourage. She also informed us that she would be happy to read our tea leaves. “Do you remember an electrical storm?” Guy asked. 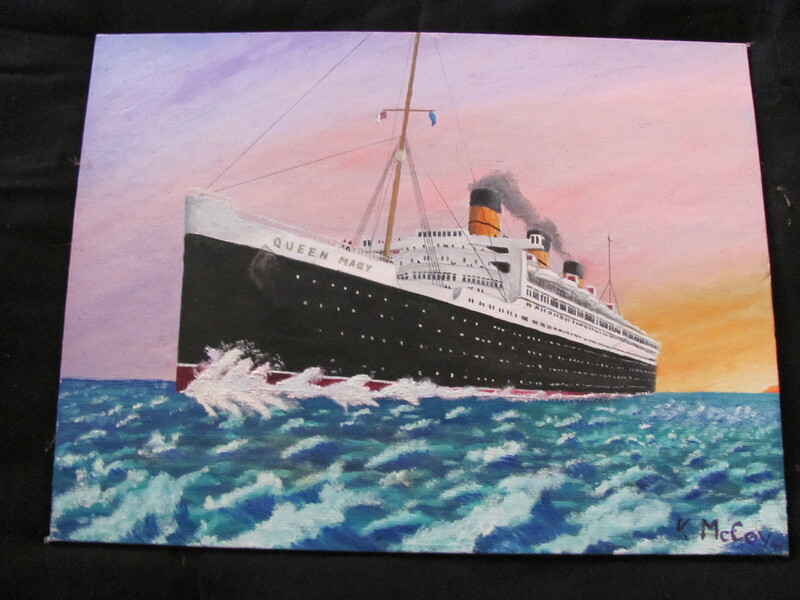 Tagged as "Queen Mary" "The Travelers" "Transatlantic Liner" "Luxury Liner"